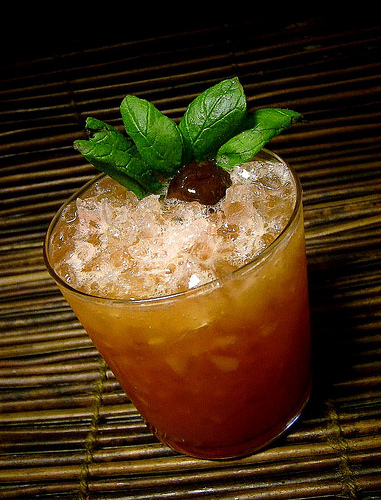 February – dubbed the “tiki month” by Doug Tiki Doug is soon reaching its end. That will not mean that my posting of tikidrinks will reach its end..they will always be present as they are a part of my life. But to “finish” this tiki-month and to find a reason to try out my newly made batch of vanilla orgeat i took up my copy of Grog Log and found a drink with a interesting name, “Polynesian Paralyzis”. It was a H Allen Smtih who in his book “Waikiki Beachnik” diagnosed the symptoms of polynesian paralyzis as a “screaming desire not to work or do anything that requires any physical or mental efforts” (!) Reading further i also get to learn about the most extreme case of this “disease” at that time (1920) called “Waikiki pip” – being that of Duke of Windsor who went on to renounce the throne of England.. Curious of the effects of this drink which was given such a name i went on to mix it,safely on a saturday night. Unfortunatley one of the ingredients called for is an ingredient i really would like to get a chance to taste someday, its called Okolehao and is a an 80 proof Hawaiian liquor made from a mash of the ti plant and is known on the islands as oke, unfortunately not made anymore. I remember reading at some point that oke was going to be produced again but haven`t heard anything more about it. There´s a thread on Tiki Central about it for those who would like to read. I haven`t played with fire for too long so i added a half passionfruit shell filled with JWray soaked croutons and set alight. Flaming tikidrinks really are impressive when served in a dark room. Blend with 12 oz crushed ice for 5 sec. Pour into tiki bowl (or mug) I garnished with a blood orange slice and a half passionfruit shell with JWray soaked croutons on fire. I find this drink refreshing due to the agricole rum`s grassy flavor and paired with fresh orange juice and orgeat its really nice. Its quite strong so after 2 or 3 of these you`ll have enough. After one at least I didn`t feel like being too active so the name is quite fitting, maybe only the zombie is worse, or the spindrift which is 0.5 oz stronger. Is there any other tiki drinks that are strong like these? 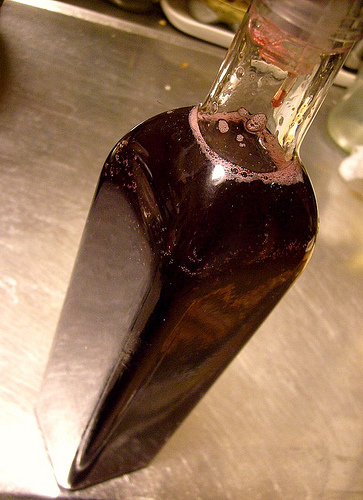 What happens if you throw in a handful of dried hibiscus flowers into homemade bright grenadine? – it turns to teh awesome…. 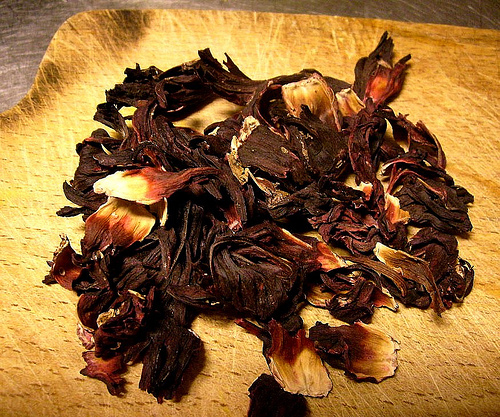 When you make homemade grenadine it usually gets paler in color than the commercial variants, but with the dried hibiscus flowers added this isn`t the case anymore, the hibiscus flowers inparts a blood red color. And on top of that they also add a very fresh crisp and floral tropical flavor. It was my friend Chris Stanley from Rookie libations who first told me about adding dried hibiscus flowers to the grenadine, and i will be forever grateful. 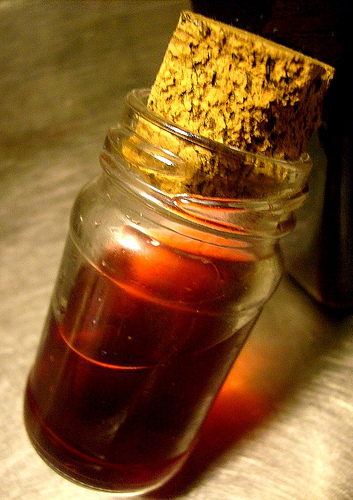 Commercial grenadine cannot compare to homemade and its worth the little effort to make it yourself, it doesn`t take long time either. But you need to have fresh pomegranates and these are fairly expensive, but for home use 1 large pomegranate makes about 1L grenadine. But the measures are a bit approximate but this is a forgiving recipe, it´s not like baking where everything has to be exact, sometimes i use one large pomegranate (if it´s huge) and sometimes i use two if they are a bit smaller. Same thing with the flowers, i throw in “a handful” and it always works like a charm..
Get 1-2 large pomegranates, check that they are of good quality. 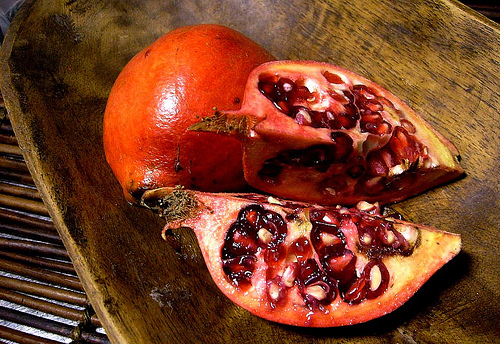 To easiest separate the seeds from the bitter membrane, just cut the pomegranate in quarters and brake loose the seeds under water in a bowl. The seeds will sink and the membrane float. 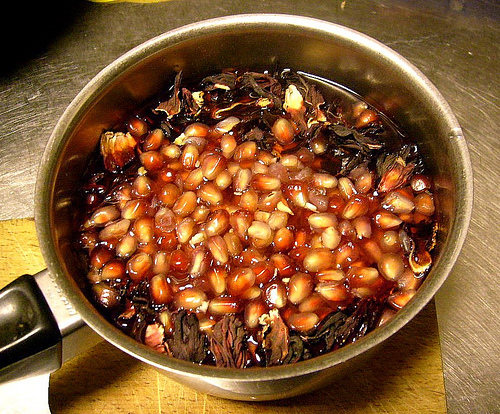 In a pot make a simple syrup by adding 1:1 sugar and water, and add the pomegranate seeds and a good handful of dried hibiscus flowers. I find my hibiscus flowers in a health shop. Then lightly boil this for about 5 min, then simmer for another 10 min before taking off the heat and set aside to cool. Leave to cool and set for 1-2 hrs to really get the flavors out. Then strain and bottle in a clean bottle and keep the grenadine in the fridge. I dont know how long it lasts before it go bad as I always use it up fairly quick, but I would guess 1-2 months. To get a really bright red color its best to use white or light colored sugar. See what a bright red color you get because you combine both pomegranate seeds and hibiscus flowers…and it´s all natural. As I`m very fond of raw sugars and not so much like the refined white sugar I use a raw cane sugar that is called oxfam and it has a very lightly tinted white/goldish color which doesnt darken the final grenadine color. Here is one of my favorite drinks containing grenadine and which becomes even tastier with hibiscus grenadine. Blend with 1 cup crushed ice for 5 sek and pour into collins glass or nautical tumbler.Add more crushed ice to fill. Blend and pour into Port Light glass, or a red tumbler with cracked ice. Decorate with fresh mint. The same drink using scotch instead of bourbon is called Starboard Light. The Port Light and Starboard Light cocktails were originally served in special glass “Marine Tumblers” – the red glass for the Port and the green glass for the Starboard.